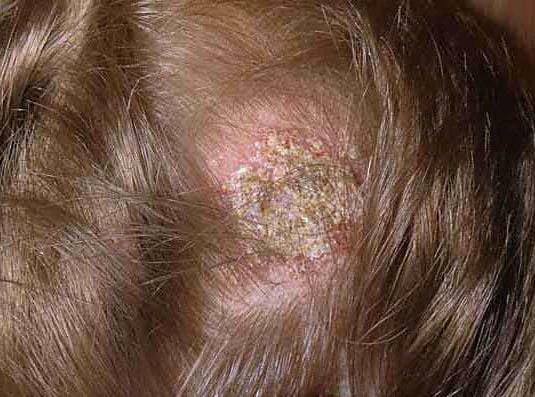 Microsporia (synonym: microporos, ringworm) - contagious skin disease and hair caused by pathogenic fungi Microsporum. Infection occurs mainly from patients microsporia cats rarely dogs, in 20% of cases of sick people. The incubation period from 5 days to 6 weeks. Ill more often than children, can be epidemic in children groups. When microsporia smooth skin appear flaky multiple erythematous patches, more often rounded with the bright swollen roller on the periphery, they increase in size and have a tendency to merge into plaques. In the resorption of the Central part of plaques often take the form of the rings and arcs. Microsporia of the scalp (Fig) characterized by erythematous patches diameter from 0,5 up to 5-7 cm, covered with abundant small asbestovyi scales; hair becomes dull and are cut at the same level (4-8 mm from the bottom) - take the form of cut, fragments of hair easily pulled forceps, with the naked eye can see the grayish-white sleeve covering the root of the hair. Usually the number of lesions 3-6, but can be one big hearth (up to 15 cm in diameter) with multiple small screenings. Sometimes amazed eyebrows, eyelashes. On the skin of the trunk and limbs may be allergic rash that does not contain a fungus, especially when irrational treatment of the primary lesion. Diagnosis is based on clinical symptoms and detection of pathogenic fungi on microscopy of skin flakes or hair; auxiliary importance glow of lesions green light under the rays of the fluorescent lights in a darkened room. Treatment smooth skin - daily lubricate the lesion focus: in the morning 2-5% iodine tincture, evening - RUB antiparasitic ointment (10% sulfur-tar, ointment of Wilkinson or other). The scalp is treated in specialized hospitals; hair shave, inside appoint griseofulvin: children up to 6 years, 1-2 times, from 6 to 12 years to 0.25 g 3 times, over 12 years and adults on the 0.25 g 4 times a day until the first negative review fungi, and then the dose is gradually reduced. The average duration of treatment 1.5-2 months. Hair in the lesions are removed with tweezers. With contraindications to treatment grizeofulvinom use hair removal (see) with 4% the patch epilinovogo or x-rays followed by the application of disinfectants and keratolytic funds daily for several weeks. Prevention: the isolation and treatment of patients, current and final disinfection (see Disinfection, table); inspections with the use of a fluorescent lamp of people who were in contact with the patient (family members, children in children groups), made before the final disinfection and within 14 days after it 1 time in 5-7 days depending on the type of pathogen. Sick should not be allowed in children's groups to obtain triple negative tests for fungi. The struggle with the stray cats, the veterinary control over domestic cats and dogs. Microsporia (microsporia; synonymous with micropores)- contagious skin disease and hair caused by various species of fungi Microsporum. Microsporia - the most frequent in the countries of Western Europe, America, the Far East dermatomycosis. Etiology. There are three types of agents of microsporia. I. Microsporum Antropogennye (infect humans) Microsporum audouinii (options) tardum, M. umbonatum) and M. ferrugineum (rusty Microsporum; synonym: M aureum, M. japonicum, Trichophyton ferrugineum). II. Mikrosporumy zoofilia (parasites in the skin and fur of animals, from which infects humans) - M lanosum (fluffy Microsporum; synonym: M felineum, M. canis) and M. equinum - exciter M horses. III. Mikrosporumy geophilidae (saprophyticus in the soil, rarely cause Meters in humans and animals) - M gypseum (synonym: M fulvum, Achorion gypseum), M. nanum, M. vanbreuseghemii, M. coukei. Epidemiology. In the USSR epidemiological role play only fluffy and rusty Microsporum, in other countries - also Microsporum of Audouin. Microsporia are mostly children, M. lanosum often affects adults. The contagiousness M, called M ferrugineum, very high. Infection with M. caused by M. lanosum, occurs in 80% of cases of sick microsporia cats, dogs or less through the contamination of their hair; 20% - from M sick people. Infection geophilidae Microsporum is transmitted through contact with soil. Epizootic M. among cats coincide with the outbreak M people. Pathogenesis. The emergence and development of M contribute to injury, maceration and disorders of skin hygiene. The fungus first introduced in the corneal layer of the skin, then the hair; nail is not amazing. Over and symptoms. The incubation period lasts 5-7 days; if microsporia, called M ferrugineum, up to 4-6 weeks. The lesions on the skin can be in the form of 2-3 rings, are included in one another; on the head - centers multiple, without visible inflammatory phenomena, with a tendency to merge and location in the marginal zones (Fig. 1). M. lanosum on the skin forms of multiple inflammatory spots, often amazes lanugo; on the head arise 1-2 big rounded otrubevidne flaky focus with clear boundaries and highly fallen hair and a few small pockets irregular shapes (Fig. 2). Inflammation may be missing, but there are infiltrative and suppurative form. For all types M. break off hair on 4-8 mm above the skin and shrouded whitish-gray case. There defeat of eyebrows, eyelashes. For microsporia chronic, puberty coming of self-healing. During suppurative form M. occur secondary, allergic, skin rash (microsporida, lichen microsporicus), not containing fungus. The diagnosis. Microscopic examination of hair seem shrouded in case of small (2-4 MK) mosaic located dispute (Fig. 3). Affected by fungus hair are characterized by a greenish glow under a fluorescent lamp. Culture Meters ferrugineum on environment Saburo has leathery, feliformia character, rusty color, consists of mycelium and mass chlamydospores. Culture Meters lanosum is a flat disk covered with a whitish-yellowish down, with radial grooves; microscopically large characteristic pointed multi macroconidia (spindle) with a two walls. Treatment. The affected skin cuticles iodine tincture, and then RUB sulfur-tar-salicylic ointment. For the treatment of Microsporum scalp using 4% epilinovy patch that causes loss of hair of the head; antibiotic griseofulvin - oral (hair while shave); if contraindications to the use of these drugs spend fractional hair removal-ray view. Prevention M. caused Meters ferrugineum, is to re-inspections (with the use of fluorescent lamps) family members of the patient, children in the team and quick isolation of detected patients. In the fight against M. caused Meters lanosum required coordinated work of medical and veterinary services, the destruction of cats in the pockets of mycosis, systematic collection of stray animals. It is also important the implementation of current and final disinfection in the centers. Fig. 1. Microsporia scalp, caused by rusty Microsporum. The lesions in the marginal zone of the head. Fig. 2. Microsporia scalp, caused fluffy Microsporum. A large, round the hearth, and a few small pockets. Fig. 3. Hair, struck by Microsporum, surrounded by the case of the small, mosaic located dispute.